It's Marth from Fire Emblem! Here's to more drawings in 2019! I have an Instagram with my art as well! Follow me on Twitter if you want! Wonderful, very majestic and good-looking, as is the castle. Full of details on the walls, windows and doors, I love it. 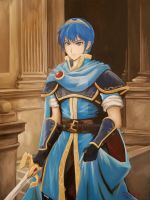 Since I'm also a handsome guy like Marth, I like seeing this and identifying with him. Yeah I decided to put a lot of effort into the background so I'm happy you like it! No need to worry, you make drawings of both genders very attractive, and I like that for the very different reasons we discussed. Thanks to you too for always liking my comments and for always making me feel better by making those pretty drawings full of details I always enjoy seeing. A great drawing I love the Fire Emblem saga. I love how you got King Marth.